Ritz-Borella has been a prominent cinema hall for passionate Sri Lankan filmgoers who used to watch Gamini Fonseka’s action packed films in the 70s decade. The glimpse of a film cutout displayed in front of the Ritz cinema in turbulent times was a sigh of relief for film lovers who have experienced the magic of the golden era of Sinhala cinema. Ritz cinema over the decades has weathered storms to survive for the sake of filmgoers. Times have changed and now the local cinema has embraced digital technology. MPI is one of the leading film circuits in Sri Lanka. It is on a quest to endow world class cinematic experiences to local filmgoers. MPI film circuit has under its umbrella a modern theatre complex in Colombo City Centre (CCC) namely Scope Cinema, with six cinema halls. It also has acquired Ricky 1 and Ricky 2 cinema theatres in Fort. The newest acquisition of MPI film circuit is Ritz Cinema Theatre in Borella. 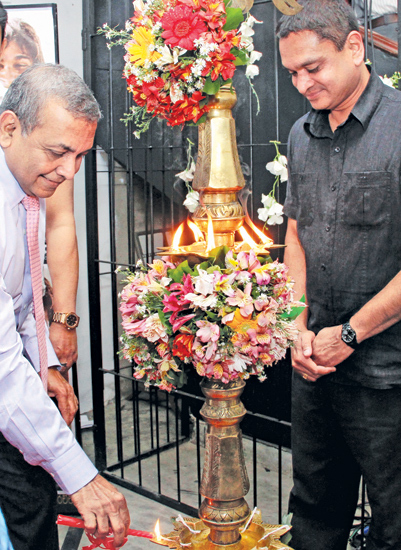 Subsequent to renovations Ritz - Borella was ceremonially opened by the State Minister of Highways and Road Development and actor Ranjan Ramanayake at the auspicious time of 10:30 am on January 31.
film producers, Sunil T Fernando, Tissa Nagodawithana, Nimal Kularatne and Dr Arosha Fernando. Cabinet Minister of Housing, Construction and Cultural Affairs, Sajith Premadasa under whose purview functions the local film industry was to be the Chief Guest of the event. However he has sent his congratulations through Minister Ramanayake as he could not attend due to a health condition. Speaking at the event, Minister Ranjan Ramanayake said, he could recall coming to the Ritz cinema with Vijaya Kumarathunga and Dilhani Ashokamala in Viyaya’s vehicle for the premier of the film Obatai Priye Adare. “Around 2000 people were present that day to see the film on its first day. This is the enthusiasm our film fans had at the time. While the film was being screened successfully, Vijaya was murdered. Starting from that day the film continued to be shown for 125 days”, he said. He added, “At the time films were made with negatives. Today Ritz cinema has become an E-cinema. The cinema will have 2K projection facilities soon. I pay my gratitude to MPI film circuit for upgrading local cinema sphere with world class technology”. “Cinema should give monies worth for the audiences. For that to happen, it has to be upgraded to be on par with world standards. Cabinet Minister Sajith Premadasa inherits a legendary lineage from his father, President R Premadasa towards adding value to the Art sphere in the country. We all can be rest assured, he will add value to Sinhala cinema and the NFC. I will stand by him”, said the minister.